You remember a couple of posts back I mentioned the range of Kosmos two-player games, well, this is another one. 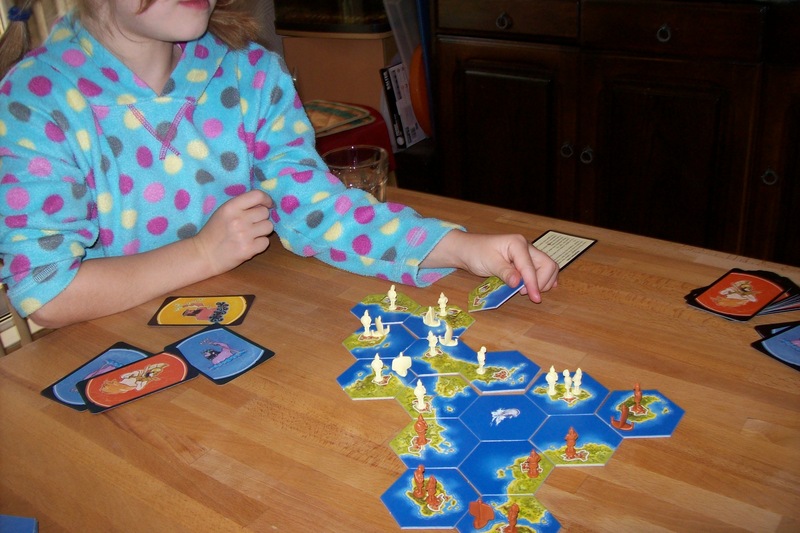 Kahuna is a cute little strategy game based on building magical bridges in a South Sea archipelago. 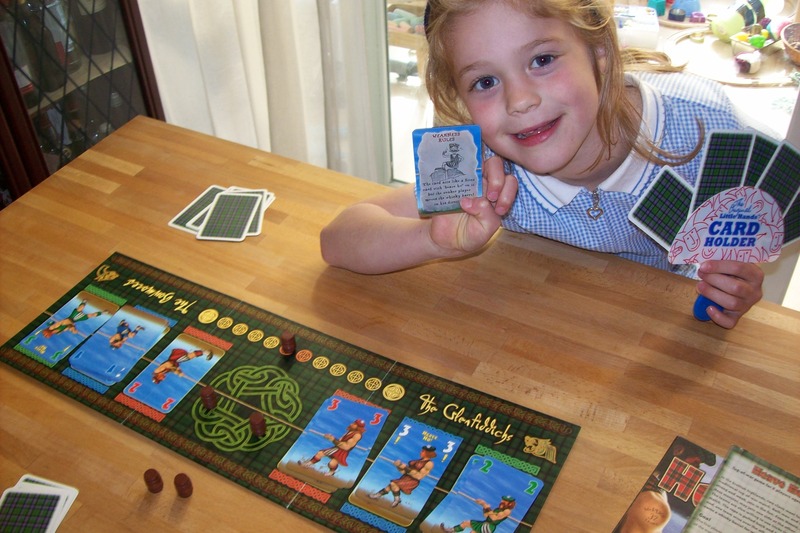 It’s a decent little game and Miss B requested to play it right after our couple of games of Clans, as previously reported. I’m sorry, but this really is a bridge to Faaa. This was another game that went remarkably well given that it is actually a pretty abstract strategy game where you need to be working on a big picture as well as dealing with the little details. Miss B did get fixated for several turns on the possibility of removing a particular bridge, if only she could get hold of the right card to go with the one she had in hand. 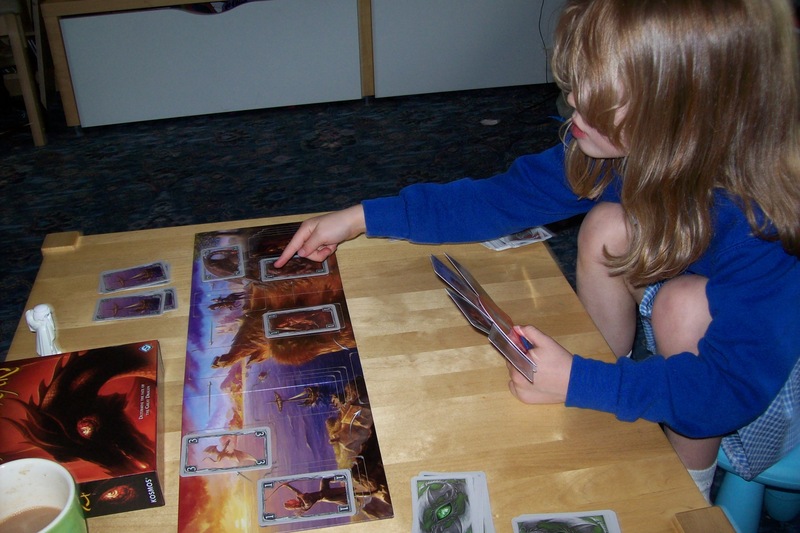 I needed to look at her hands and make suggestions on quite a few occasions, particularly when the board had got very full later in the game. While we had fun with this (and finished with me only one point ahead), I think we probably won’t be playing this as much as some of the other games we’ve tried recently. In a year or two, I think Miss B will get a lot more out of it. But we’ll just have to see how we do on requests to play. I may well be surprised — as I often am! 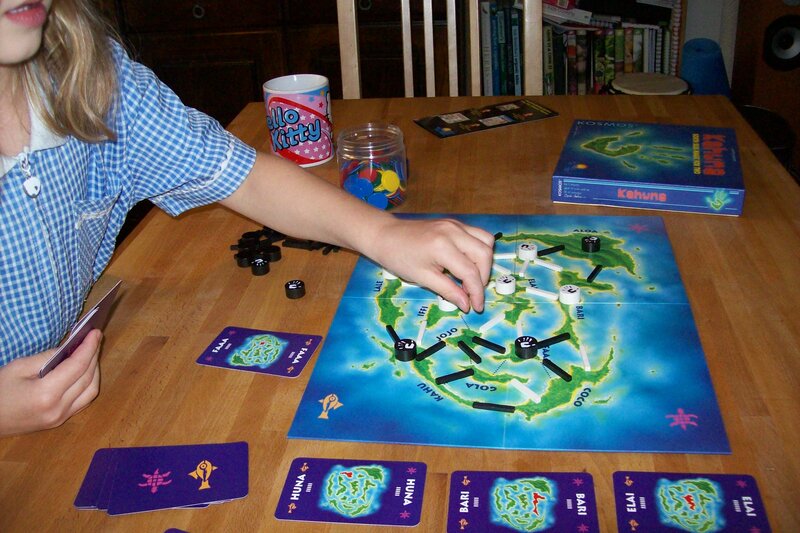 The game: Kahuna (Kosmos), 2 players aged 10+. I’ve had Heave Ho! on the shelf for a few years now, and it’s been played a few times. 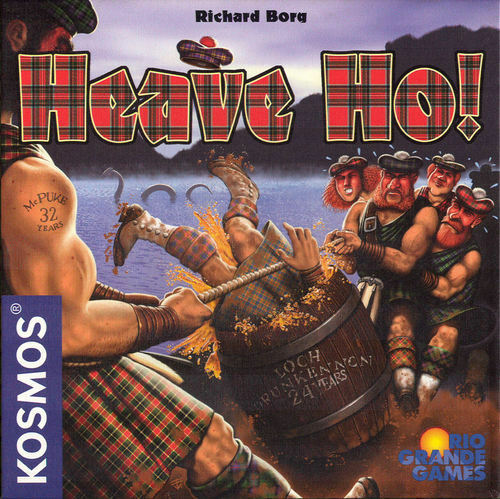 It’s not a bad little lightweight 2-player game which has a lot of luck, but it has cartoon Scotsmen pulling on a rope and a Nessie card, so what’s not to like? I’m not going to review the game here (and I don’t think it’s available any more, anyway), but I’m sure you can find a review out there if you look. Here, for example. So stripping down to the very basics, we played with just the male tugger cards, no dames or actions. We also just played with a single stack of cards using a “draw a card then play it” rule. This worked well and Miss B quickly got used to playing cards onto the matching colour stack and (mostly) giving herself the good cards and me the bad ones. Though a couple of times she took a shine to a particular card and decided she really wanted it, even though it would be better to give it to me. Of course, playing a “Heave Ho!” card is quite an event, involving shouting out excitedly before a lengthy exercise of counting up the scores on each side (Miss B is currently learning some adding and subtracting and enthusiastically — and usually accurately — employs fingers to help), deciding which side has the best score, and moving the barrel accordingly. Miss B won, without me even helping it along (something I don’t generally like to do). At the end of the game, we looked at the cards that were left out and I agreed that next time we would use the ladies as well. It’ll be quite some time before we introduce the action cards, but we’ll probably soon try with a hand of cards rather than just one at a time. We’ll probably stick to just one round at a time for now. The verdict from Miss B (aged 4¼): “I liked the best bit because I winned. You losed because your team didn’t pull hard enough.” Proving that you’re never too young to gloat.